Fans of dungeon crawlers, fantastical adventure, and monster killing will find Fate a welcome arrival to the Mac platform. 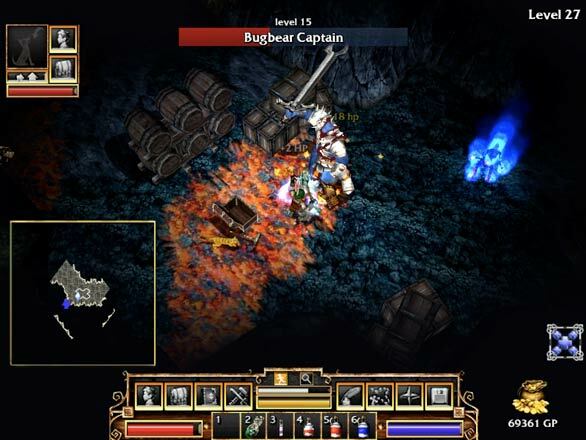 A dungeon crawler, for the uninitiated, is a genre of role-playing game where a player must guide a character through increasingly difficult levels of dungeons while confronting monsters, traps, and other obstacles. 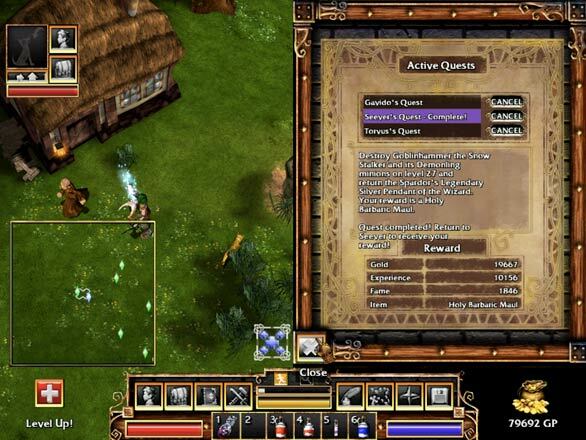 Through the journey the player can customize their character by upgrading his/her abilities, weapons, and magic. Sadly, Fate not only cuts out the fat of the genre but tosses out the baby with the bathwater. While Fate offers perhaps the deepest dungeon adventure experience ever, its narrow focus and unremarkable world will deter a broader following. Fate was a sleeper hit for the PC in 2005 and there is good reason to see why the gaming experts enjoyed it. The game play is deep, the replayability is high, and thanks to the randomly generated dungeon maps, there are virtually infinite numbers of dungeons to explore. While the weapons, battle system, enemies, and maps are themselves unremarkable (bordering on uninspiring), the game’s major selling point is for gamers who love the ability to unlock and explore every niche of a game. After completing the first 50 levels, the player has the ability to retire the character and start the game over with a new character that can inherit an item from the previous character-a family heirloom of sorts. The randomization of the dungeon levels means you’ll encounter new levels the second time around and Fate could play out somehow differently. In addition to new maps to explore, monsters and treasures are randomized. When you die, the Grim Reaper-like embodiment of Fate offers you a variety of resurrection choices, each one with a cost. Strikingly, you can actually be resurrected at a better level than the one at which you died, making Fate’s randomness a tempting and chaotic element to the game. Gambling and vendors that may or may not help you also break up the monotony of simple leveling. But as chaotic as Fate’s dungeons are, the rest of the game is remarkably pedestrian. That is to say, the developers didn’t take many risks and instead produced one of the least compelling stories and worlds I’ve ever encountered. You start in the town of Grove, a classically cliché happy little town that happens to be built next to a dungeon full of monsters who (we’re told) occasionally come out and harass the town. You can purchase items from the dozen or so shopkeepers or ask them for quests. There’s a place to gamble, a place to enchant, and finally, a storage chest. Fate offers precious little introduction to the story and instead expects you to be so bored with the town that you’ll wander to the dungeon post haste. You’re told there’s something really big and evil in level 50 of the dungeon, but that’s about it in terms of a goal to work toward. You’re given a pet to start out, either a dog or a cat, which can be upgraded and leveled up much like your character but cannot die (if it loses all its health, it simply flees). By feeding fish to your pet, you can transform the animal temporarily or permanently to something stronger, but this is easier said than done. Places to obtain fish are plentiful in the initial levels but are sparse later on, and the fishing minigame is not only tedious but has an annoyingly low rate of success. Without the fish, your pet will remain in whatever form it was last transformed to. Having your pet cat Whiskers still following you around at level 30 is not only embarrassing, but puts you at a disadvantage in combat. When in the dungeon, the preferred way of leaving (without losing your place) is to use a town portal. After completing quests (which follow the predictable kill-something-then-return-to-town pattern) or collecting enough items to overburden your pack, you’ll want to come back to town to collect rewards or sell your found goods. Alternatively, your pet can be tasked with going to town, selling all of its equipment and then returning to you, but the pet will be gone for a while and you’ll lose its abilities in combat until then. You’ll want to return to town often in order to get new quests, though these quests do not advance the plot at all. They are useful for upgrading your fame and your experience. Experience will grant you new abilities and fame will increase your reputation. Alternatively, you can pay off the local musician to sing your praises and increase your reputation and abilities without all of that annoying accomplishment business. Fame can indeed be bought. The overarching problem with Fate is not its concept as a trimmed down, focused, deep dungeon crawler. The problem is the execution is boring and clumsy. Though not crucial to an enjoyable experience, the soundtrack and story are forgettable. The save system is unforgiving because you can’t save multiple games of the same character, making your deaths and the randomness of Fate that much more frustrating. The monsters are the usual fare: vampires, ghosts, goblins, etc. The new additions to fantasy folklore, such as evil unicorns and brain beasts, border on satire. The weapons are common as well, and the combat is simply left click to attack and right click for magic. Unless you actually decide to attack, your character will just stand there and get pummeled. The character’s appearance seems to have been an afterthought-there are no classes or races to choose from, only a boy or girl gnome-like creature with differing facial features. Players who are used to specialized classes and enthralling character-based RPGs will be disappointed. For me, spending hours looking at the same droll dungeon maps and loading the same spells and clicking the same attack commands gets old. While the levels’ maps were different, they all looked the same and there was never a sense of building up to or accomplishing anything. The grab bag monsters on each level keeps you on your toes, but the levels blur together and lack cohesion. For me, playing through the nonexistent story, completing the same boring quests, and selling my weapons to upgrade my powers felt like work. But while frustrating, Fate is definitely addictive. I wanted to save up enough money to get that new sword, and I wanted to see what effect this new enchantment would have on my armor-hopefully then, I rationalized, the game would become more fun. After playing through dozens of levels, I realized that the game didn’t have a second gear or a new trick to offer me. It would continue to be more of the same. For a game that was originally released in 2005, the graphics were likely remarkable. Though Fate ran beautifully on my 2.66GHz Core 2 Duo MacBook Pro, the graphics looked pedestrian by 2009’s standards. But while the graphics are dated, one benefit of a late release to Mac is there is already an active modding community for Fate; so for the obsessed adventurer, the experience gets only gets richer. Dedicated fans of RPGs and dungeon crawlers will likely make this game a cult classic. Fate is likely to be misunderstood by the common gamer and lacks the varnish or flashy characters of a sexier, more superficial game. But like the pint-sized protagonist, it gets the job done: the random levels, monsters, and rewards means that if you live to dungeon crawl, this is a game you must play. You’ll have to excuse the rest of the gaming community, however, if we laugh at the evil unicorns.